So a couple of years back I had a cabinet makeover…NIGHTMARE. I painted my kitchen cabinets white and it took me hours and hours. I applied a poly coat on top and the next day they started turning yellow. I cried. I was so frustrated with all of the prep work and time it took and then for them to turn a yucky yellow color? Definitely, my biggest DIY fail ever. 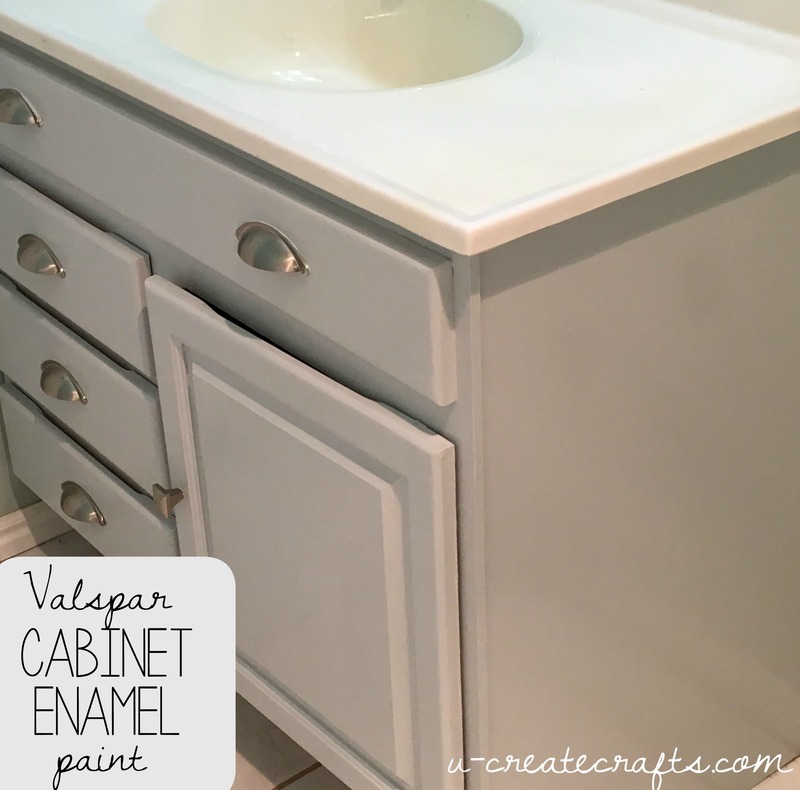 When I had the opportunity to try out a brand new product by Valspar, their Cabinet Enamel paint I was nervous. I decided I would tackle a small project to see if I liked the paint. It was supposed to leave no brush marks, no yellowing, and even cover old finishes! I decided to try it on my basement bathroom and wanted a light, gray look so I chose the Valspar Granite color. I grabbed my headphones and a good audible book and went in. My cabinets didn’t need any prepping because they were pretty smooth, but I would suggest giving your cabinets a light sanding if you have any bumps or major imperfections. I could’ve gotten away with only one coat, but it gave it that professional look by adding one more. I added some hardware and LOVE how the cabinets turned out! Make sure and check out my dresser makeover! I transformed my dresser and gave it a whole new look with Annie Sloan chalk paint! Thank you! I’ve been looking at this paint wondering if it’s all that it promises. Looks great! Do you have a ‘before’ picture, or can you tell us what your cabinets are made of? The usual faux-wood composite stuff? The before picture was the white cabinets that looks a little similiar below. The cabinets are oak and they had a clear finish on them. I painted them with a white paint by another brand and have never liked how they look. 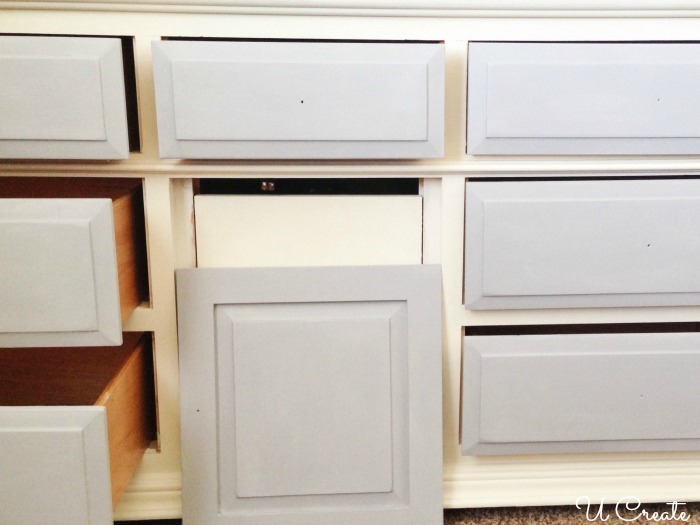 Decided to go a light gray with this awesome Valspar cabinet enamel and they look way better! Thanks for asking Becky! How did you prep your cabinets? so technically you don’t need to sand them because it “covers over other finishes”, but I did give them a light sanding just to get rid of a few imperfections/bumps and that was it! I just used this product on my bathroom cabinet and wall mirror frame, both are laminate. This was my experience. I HIGHLY suggest that you use a BONDING primer (2 coats) before using this paint. It is recommended if you read the back of the can. No need to sand. The enamel paint goes on beautifully and has very little odor. I suggest using a roller made for smooth surfaces and a good quality paint brush to get in the crevices. Here is the important part, wait 12-24 hours (ideally 24) before putting on a second coat. Enamel paint does not dry as fast as latex. I only waited 4-6 hours when doing my mirror frame and 3 days later, it still feels a little tacky. I painted my base cabinet in the morning. I waited for it to “look dry” and then I put a floor fan near it to help speed the drying time. I will put the second coat on tomorrow and repeat the drying process. I am not sure of this products durability, this is my first time using it, but it sure does look great. I hope with time it will “cure” and become somewhat durable. Thank you for your feedback Laura! Hey just wanted to see if you could let me know the durability. I’m considering doing this to my kitchen but I’m trying to find some long-term results from people. Hi Amanda, So I’m coming upon one year and my cabinets still look fantastic! I know one year isn’t a long time, but I’ve been so pleased so far! 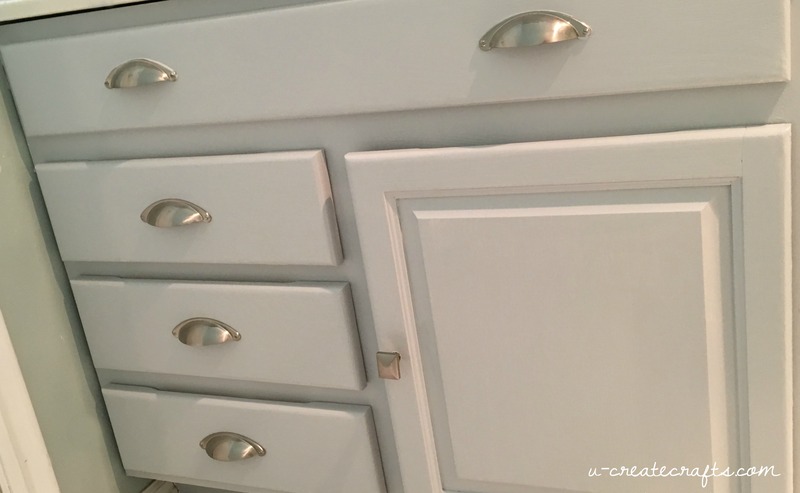 I used rustoleums kit in white to redo my cabinets about 2 years ago. They are turning yellow!! No one notices bc theres not much light in my kitchen but its sickening all the work i put into it! Im glad i did the bottom cabinets dk brown. I may try this next. Since my cabinets are small in the bathroom I actually used my favorite Purdy paintbrush, but I would also recommend using a small roller! Thanks for the review! I am using this tomorrow in my kitchen. Let me know how you like it Lisa! Will ill be able to glaze on top of t paint? I’m trying to give it a little bit of old look to my cabinets. This type of paint already has a “top coat-like” finish when it dries. If you are going for a more rustic look I would suggest a chalk paint or furniture paint by Valspar. Great question! The thing I love about this paint is that you do not need a top coat. The cabinet enamel dries like you already put a top coat on it. I’m actually not sure about a satin finish in this paint. Thanks for asking! How is the paint holding up? I’ve used Benjamin Moore Advance on furniture and it is great. I’m about to paint my kitchen cabinets and am looking at all of my options. I’ve only had the cabinets painted for a few months so it’s really hard to say because they still look brand new! Very easy to wipe off, too! I can’t find any local retailers that carry it. Do you know where I can purchase this paint? You can usually find it at Lowe’s or Ace Hardware. How long did they take to dry since they are “oil enriched”? I wnat to do my kitchen but I was wondering if they would be tacky? I let mine dry overnight and they didn’t feel tacky anymore 🙂 This paint definitely takes a little longer to try than many paints! Kari, I am looking to paint my oak dinning room table because after 16 years of kids projects the finish is completely awful, it is tacky and I am ready for a change but not wanting to purchase a new set as I love the table itself…would you recommend this paint for a dinning room table and chairs??? And can I get the paint in different colors? I would actually only recommend this paint for cabinets because of the high glossy enamel — which is great for cleaning high traffic areas by the way, but with a dining table I would go with the Valspar Furniture paint that is similar. You also don’t need to prime, just a light sand on the bumpy areas! I’ve been going back and forth on painting my kitchen cabinets. I found this paint today at Lowes and I saw it said “semi gloss”. Not sure I would like that. Can you tell me if it is shiny? I like satin finish better. It does have a little bit of a shine. I actually prefer a satin finish, too, but am so pleased with how these turned out! I actually used this same paint in my master bath. (Trial use before using on my kitchen) I wanted an antique finish and realized after I had started painting that I was suppose to have bought the chalky paint. Instead of taking it back, I tried it with the glaze. I LOVE the finished look although it took quite a bit of time. Will use same stuff in kitchen and am prepared to take at least a month to finish. I lightly sanded everything beforehand and a little after for a distressed look before glazing. I am using on my kitchen cabinets now and I love it! Definitely use a foam roller though and the purdy all purpose brush for hard to reach areas. I sanded fairly well along with two coats and the outcome so far is amazing. I love this paint! 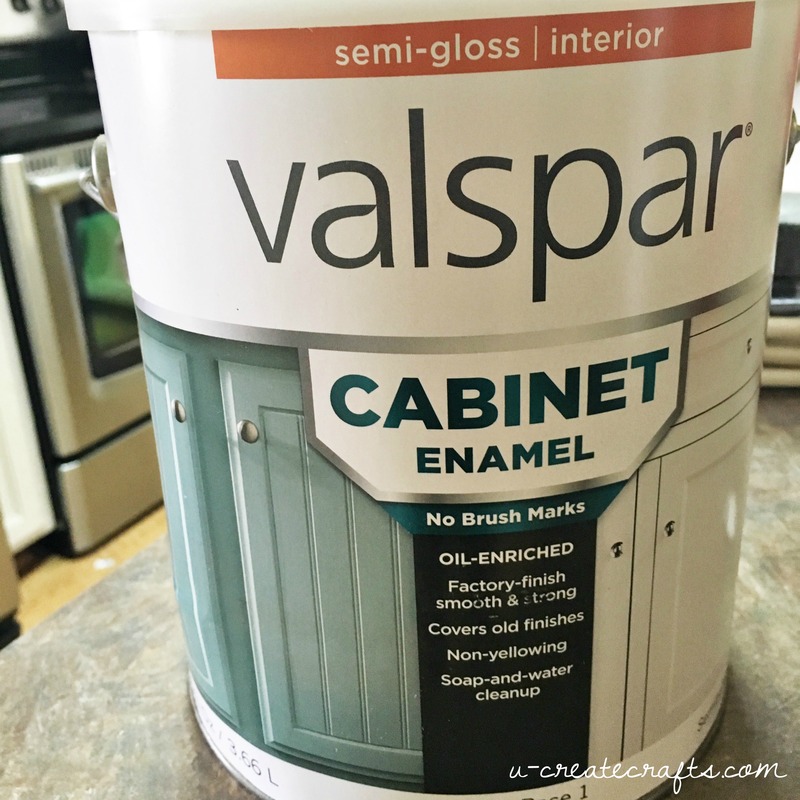 I love anything Valspar! I’ve been using their pre-mixed samples to make my own chalk paint and have had great success. But I would like a more durable high gloss finish for my bathroom vanity. It’s one of those 90’s laminate style with the gold raised edges…yuck! I think the cabinet paint might be just the thing. Thanks for sharing and I’ll let you know how they turn out. I’ve wanted try this, but I wish it was tintable to the color I want. I thought they could tint it in any color? You can. At Lowes they tint the cabinet paint to any color. I just did my bathroom cabinet in a java color and it’s perfect! I am so thankful I came across your blog. We just moved into our house and I can’t say enough how much I dislike white boring cabinets. I was at Lowe’s this morning contemplating what method from pinterest I was going to use to paint my bottom cabinets and saw the Valspar Cabinet Enamel. You have answered my question. I can’t wait to start this project, starting with my master bath on Thurs. I am contemplating a kitchen redo but first thought of painting my 1952 cabinets and replacing hardware and countertop. Is this product available in sample size so I can see how it looks on my cabinets? They are knotty pine and have been painted many times. We have lived with chipping and scratches on them for the past 9 years and have kept a can of paint handy for touch ups. Do you know if this paint works well over old paint? I am so excited to try this and save some money! Trying a sample size first would be great! I know that Lowe’s and Ace Hardware both carry it so you might want to ask them! It works great over old paint as long as you smooth out any rough spots! Sorry, I work at Lowe’s, and we do not carry a sample size of the cabinet or furniture paint. We can tint this product to most colors though. I used it to redo my dad’s 1975 dark oak stained cabinets and so far so good. Is the cabinet enamel extremely glossy looking? Looking at my kitchen cabinets, you can’t really tell it has a glossy finish unless you get up close. Even then it’s not very shiny or noticeable. I get compliments whenever somebody comes into my kitchen! I painted my kitchen cabinets with Valspar chalk paint and then waxed them with annie sloane clear and dark wax to make them look old. no need to do anything to the cabinets first but wash them down. I may try this on my laundry room. seems easy enough! How is the paint holding up now? Also, did you paint your kitchen cabinets, too, or just the bath vanity? Thanks! I did actually paint my kitchen cabinets white because I loved the paint so much! It is holding up great! So easy to wipe off and clean to because of the enamel! Thank you for posting this! Kitchen is my next project and I’ve been debating what to do about my orange-y oak cabinets. We are painting our living room and the Valspar paint is wonderful, light gray paint + primer is covering dark forest green with one coat. I’m so happy with this paint. So I’m likely to trust Valspar again. I’m concerned about the odor. I can’t take my cabinets outside to paint them. How bad is the smell? The can says use in a well ventilated area. I only have one window in my kitchen. Really want to use this paint. The odor is not bad at all. It’s not oil-based so it didn’t bother me. I painted my craft desk with this indoors and only opened a small window and I was fine. Great question Phyllis! Would using a sprayer better than just a roller/brush? anyway, I really like white too. I am planning on painting my cabinets and maybe even my chair. Hi Joel, I’ve actually never used a sprayer with this type of paint. I would definitely be interested in hearing from any of our readers who have! We just painted the island in our kitchen. We used a paint sprayer on the cabinet doors for the second coat, Becuase the paint brush left brush strokes and they turned out awesome. I will definitely use the sprayer on all the cabinet doors in the future. I’ve had mixed results with valspar paints and the reviews are very mixed here, but the paint sounded like what I needed so took a chance. I just applied the paint so I can’t speak to durability, but application, finish, coverage, and cleanup couldn’t be much better. I painted raw oak cabinets in two coats with complete coverage. The finish is definitely semi-gloss but that’s what they call it. It’s a a thin film finish just like oil. Not the thicker film you get with latex. It has a mild oil smell that is no stronger than latex, just different. And because it does level to a thin film, brush marks are almost non-existent. The woodgrain was preserved too. Brush cleaning is truly soap and water, even after several hours the brush comes completely clean. Try that with latex. This paint truly seems to possess the best qualities of oil and latex. I’m very happy so far and I hope durability is more like an oil paint too. Does the tacky feel go away as it dries? Yes, the thing about this paint is it take a while to dry, but yes the “tacky” feel goes away! I’m ready to try this! I’ve been trepidatious but you had me at “light sanding” and semi gloss! Any suggestions for a grey that works with dark gray/taupe swirl floors and a dark speckled black counter and marble backsplash would be helpful… I’ll try this product on a table tomorrow, to test it out! Yay, there’s finally hope for my dreary orangy maple 50’s cabinets! I just did my kitchen cabinets with the Valspar Cabinet Paint. Turned out absolutely beautiful! You would never know they were painted! Love, love, love it! I am ready to Refinish my kitchen cabinets and was wondering if the grain of the wood shows through this paint or the finish is a solid color? My cabinet doors have beautiful grain that I’d still like to enjoy. I’m considering a light gray color. I used two coats and I can’t see the grain in the wood. I would suggest a paint glaze if you want color, but also want the wood grain. Gray sounds beautiful! Will this paint work on laminates? The sides of some of my cabinets are not wood but appear to be some sort of laminate. Do I need to cover with a thin wood panel first and then paint? The fronts and doors are all real wood so that should be fine. Thanks! Good question Rick. I’ve used this on laminate and it works great!! Do you think this paint would work on furniture? I have a lovely bedroom set but it needs updating. It is wood with a clear finish. Thanks! Lots of questions. We have white laminate cabinet doors with an oak trim top & bottom (varnished). They are old (1986 vintage – one owner), but are still in good shape. Can I just lightly sand all surfaces including the varnished oak? or would I need to strip the varnish & prime? I don’t really want to try to redo the oak edging. Would I need to prime the laminate face, edges & back of the doors? we’re going to leave the oak cabinet frames as is…. so my wife needs to pick a color yet….. Then its on to the laminate counter top w/ oak bull nose & backsplash painting (looking for a recommended product). Hi Mark, I’m actually not sure how this cabinet paint would work on laminate. I would probably go the chalk paint route (Valspar has a great chalky finish paint I use quite a bit) and you would not need to sand and prime. I’ve used it on laminate quite a bit! If you go the chalk paint route make sure to use a couple of coats of the sealing wax to protect it! I use the clear wax. Hope that helps! Where did u get your new hardware ? Love those too! We are remodeling a mobile home that has the original bathroom cabinets. Laminate with an indentation that kind of looks like partical board. I have an old kitchen door (kitchen was remodeled), so I’m thinking of trying on that first. Has anyone used the cabinet paint on cheaper cabinets. We don’t have the $$ to replace all the cabinets at this time. This sounds like the perfect solution for me. Did you use the paint pictured in semi gloss as per can? Thank you so much for sharing. Love this. If you’re nervous make sure to try out a small spot, maybe inside the cabinet to make sure you like it. We have loved this paint and it’s still holding up great in the high traffic area! We are constantly washing the cabinets! I am doing research to paint my kitchen cabinets in the next year and this looks like a great option! My cabinet doors are real wood but the inside and outsides are laminate or something similar. Do you think I would need to use a bonding product/primer first? Nope. You would be just fine without a primer using this enamel paint. Works great! or wax you need to remove it. If you sand without cleaning you will push the dirt or old wax into the wood and you could experience adhesion problems after you paint. Did you paint the inside of the cabinet too? Just looking into doing our kitchen cabinets and wondering if i should do the onside. I painted all the trim in my house with oil based paint years ago and need to paint again. Will this paint work on trim and door facing? Will it adhere to oil based paint? Hello. 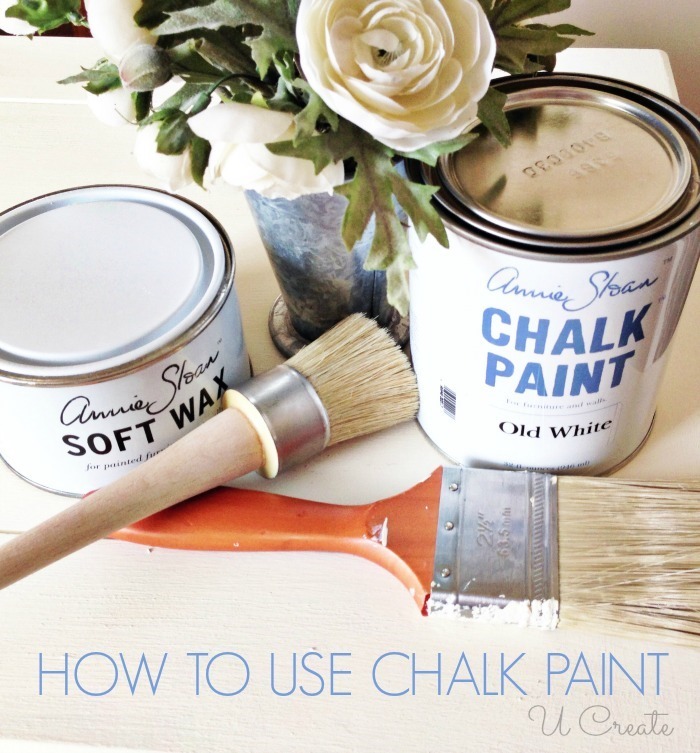 I use only Valspar chalky paint for my craft decor and love it. My kitchen cabinets are cheap and ugly wood in a very dark brown. To make matters worse, they have even darker stripes (almost black) and swords that almost look like tiger stripes. I want to say they have a tint of yellow I’m afraid they will pull that yellow tint out. Do you know what kind of cabinets they are? If so, do you think this paint will work? I used this paint on my 60+ year old bathroom cabinets. Love how they look and have received lots of complements. Now I’m ready to start in on my kitchen cabinets. Two weeks until the new counter tops and sink are going to be installed. Wish me luck! Do you think the enamel paint will go on formica cabinets? Or those cabinets that have the have the poly wrapped on them. We bought a house from the 90’s and i have not had luck painting them. Any moisture and the paint peels right off. Do you have to sand down the cabinets? The nice thing about this is there is no sanding required! How have the cabinets held up till now ?? I want to paint our kitchen white as it is so dark and doesn’t have a lot of natural light. I’ve been researching lots of different brands and I’m hoping this is the holy grail ! The cabinets have held up VERY well. I have to do a touch up once in a while because I have 4 rambunctious children running around and have to fix some chips, but I would highly recommend! I painted my kitchen cabinets black several years ago. I still like the look but I don’t get much natural light in my kitchen so I’m thinking of repainting them in more of a light gray. I’m worried that covering the black is going to be difficult. Do you think this paint covers well enough to go from a dark color to a light one? You might want to try a small section first, but I’m pretty confident that it will cover just fine!